As parents, our greatest hope in our house is that it will bring family members closer together and leave us feeling more connected. What do you do to strengthen family bonds and make sure your family stays close together? Staying in contact with friends and family is an aspect of a home with strong connections. Being able to access the telephone and internet via one simple connection means everyone in a household is able to interact with each other, and also with loved ones outside of our immediate household. School and work schedules and general day-to-day business can dramatically decreases the amount of time spends together as a family. It's time to bring family closer together by staying connected. Back in the day I enjoyed playing board games with my siblings. I remember having so much fun playing Monopoly and Scrabble, that was how I stayed connected with my brother and sister. Nowadays my three kids are entertained by playing on their tablets-- downloading tons of games and connecting each other in a game. Entertainment is a key element of connectivity in the home-- watching, streaming, downloading and sharing. It enables us to watch our favorite movies and TV shows from a bedroom television, laptop or tablet. Not to mention listening to music and playing games. Having a strong and reliable internet connection that gives us total internet experience is important for me not only for my blog, where I get to not only chronicle my life but also creatively express myself, but also because I use it everyday to stay connected to family members near and far. I use it to chat with my brother on Facebook, check out his food-related blog, fatboyeats.com, and also to Skype or FaceTime my mom and sister, or share pictures of my children and life with them instantly. My Mom and I have great Mother-daughter bonding together even miles away from each other, and now have changed the way we keep in touch in this digital age. We can see each other via videochat, and share photos and videos on social networking sites, which makes us feel more connected. It is always important to stay connected whether near of far because it's what grounds us. The relationship between parent and child is just any other- It requires attention, purpose and hard work. When you create a family, when you bring a life, or in my case, multiple lives into the world, you have a responsibility to ensure that they are not just in the world but that they understand how they belong to the world and that connection starts at home. It starts in your family. It starts with you. It is truly important to stay connected with our loved ones wherever we are in the world. Thank God for giving us knowledge to invent the latest gadgets like mobile phones, laptop, desktop computer etc. Now it is more convenient to all of us to communicate with our family and friends. Catching up has never been easier and of course, it wouldn't be possible if we don't have a good internet service provider. Having an awesome provider would make those chikas and bonding with your family on the net will truly be a breeze! Speaking as a daughter, It is really important for me to have a strong bond with my mom and dad. I am the only child in our family (I'm speaking after the loss of my younger sister). Being close with my parents will not just bring our family happiness but I think It would help me face the world stronger because I know I have the people who knows me best that would always support me; and I think this makes us closer together. Traditional home ways like eating together or watching your favorite show together are some ways to simply bond with your family. In these cases, family members would get the chance to ask how everyone is doing --- in school, at work or at anything we're up to. having a close family also guides you to who you're gonna be in the future. They're the one to guide you in your decisions and support you along the way. My love for my family would never fade and I pray we get stronger and more bonded each day. No matter what happen, A family who has established a strong foundation of bond together couldn't be moved by any kind of storm in life. They may be shaken at times, but they will never be moved. I really like internet connection that I can rely on because I also love chatting with my parents abroad, in one way or another it gives me precious time in connecting to the people I loved. Good thing you have a reliable internet connection Ms. Rochelle, may I ask what network it is? Because my parents are both OFW, i grew up with a sense of responsibility by myself.. Despite that they arent with me always, there is a way to find comunication with them. In this modern world, communication is easier than it used to be. This is a new way to reach your love ones and i am very thankful to that innovation, i can now bond with my family through this. We use skype to talk when hes off.. we have also tried Google Phone Feature which allows phone calls to any cell or landline in the US and Canada, Or in viber.. So im not longing and feeling alone for them because they get in touch with me always. Through internet connection everything is possible..
"There is no long distance about love, it always finds a way to bring hearts together no matter how many miles there are between them." As time goes by, I noticed that I am closer to my mom than before. 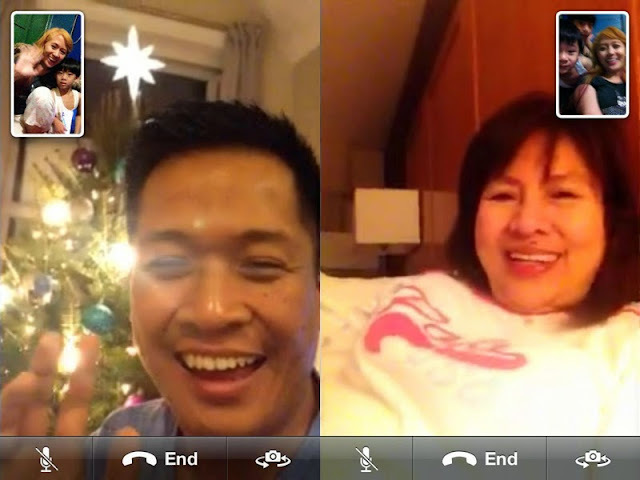 I also noticed that technology improvement affects my bonding and closeness with my mom who's currently abroad. I remember, I used to upload youtube videos before and share it to my mom ~ she said she was sooo happy seeing those videos. Since VOIP phones are now available, we have longer calls ever, like we can't say anything afterwards since we already talk a lot. haha . Its also a good way to keep everyone updated, especially when there's occasion, that make our love ones abroad to feel they're also here. Since i am in a long distance relationship, its really good to have a good internet connection. Especially, I'd been missing him a lot (hehe). Its the first time he went abroad and I really thought that everything will be the same, but I was wrong.. I really felt alone when there are times I can't talk to him, I really cried a lot haha. But I thankful with internet, its not as lonely as it should be. Even we're not together we can share things we do , and also talk for longer hours. I agree that reliable internet connection is really a great thing to have especially when you want to talk to your loveones abroad. I am just hating my connection since they came up to this FAIR USAGE POLICY that slows down your internet when you reach the maximum MB limit they offering, I just wonder how can they say its still unlimited? I really want to get a new internet connection, may I ask whats yours Ms Chelle? Honestly speaking I can't tell what family bonding really means for me because since I was a child, we are a broken family. As a child during that time I am looking for that what they called "Family Day", "Family Bonding" and other fun activities done as a family. But now that I am matured enough to understand what we only have, I just realized that since then WE are a STILL a family even my father left us because my Mom did not stop to strive hard in work para matustusan ang pagaaral naming mga anak niya. SHE do her part to be a good Mom to us. Since then she stand firm as our mother and father. Now that she is far away from us because its part of her job, hindi hinayaan ng Mama ko na mawala ang connection namin and that's a big thanks to the use of computer, cellphones and other gadgets who help us to stay connected. Walang araw na lumipas na hindi kami nagkakachat in order for us to know how we are doing and how's our life. I just want to share this thought that even if you have an almost perfect family or a broken family, wag nating hahayaan na masira ang pundasyon bilang isang pamilya. Kahit pa magkalapit lang kayo at di nalalayo sa isa't isa, it's best if we stay connected and happy to the presence of each other. Ngayon pa lang ay dapat alam na natin ang importansya ng bawat miyembro ng pamilya para mapatibay pa ang samahan ng isa't isa. God Bless to your Family ! A perfect picture of an ideal family. You are very lucky with each other Ms.Rochelle,. its really obvious how great you bond with each other. You are one example of a happy family, nakakainspire. Although me and hubby are busy we also make sure to find time to bond with the kids. After a very busy day, we make watching movies in the bedroom our bonding time. When its my day off, we take the kids to shopping then we take them to my inlaws. Itis always important for me to have a constant bonding between my kids and my inlaws as well as with my family side. Whenever we do same activities together, there is the love and joy that draws us more closer to each other. I dont like them to grow up like a stranger. They are both boys and I am afraid that the time will come na they will feel uncomfortable to open up about sensitive things to their parents. Kaya as early as possible, we make them feel assured na we as parents will always be there for them by building a strong connection. When my daughter was born and I still don't have a permanent place to stay here in Laguna to bring my family here from Pangasinan, I had no choice but to leave her there in the care of my Mom. It was really stressful and I would cry at times missing her. It would break my heart whenever I go home and she just looks at me trying to recognize me. Buti nalang may lukso ng dugo kasi after a day naman, inseparable naman kami kaya lang I get to stay for only 2 days every month. It was a good thing that the internet was made available then not to mention mobile phones.. I usually call them daily checking for updates. The available communication through the web then is through Yahoo Chat and Skype..
Now it is made even easier through social networks and android phones and applications..
Buti rin talaga digital age na kase kahit malayo talaga sa atin naka antabay pa rin sila pag grow ng mga anak natin or kung anong events rin sila meron eh, napapanood din natin sila, ang saya din talaga pag nakakausap natin online ang mga relatives natin. Di talag tayo masyadong nag-aalala pag laging tayong connected sa kanila. Life is great, Life is good! I can see from your previous post, your not only busy in the your blogosphere life but you've really shown what a real family means; happiness and togetherness, just among the few things that counts and I appreciates every story you've shared. Now even in the digital age, I observed that no one can really break the distance of your family because you and your husband really show the importance of time and meaning of love to your children. Happy New Year Ms. Rochelle! I'm lucky enough to be a stay at home mom so i get to spend every minute with my kids. Family moments at home are spontaneous, it happens any time of the day. TV time, play time, nap time and cuddle time are enjoyed everyday. Even household chores are fun because the kids are eager to help me out, i'm glad that i get to treasure these moments with my family. But as the saying goes, routine sometimes gets boring so we make it a point to go out twice a week and spend some time in the great outdoors, trip to the local park, malls or to our favorite restaurant adds up to those bonding moments we have. So happy to have a hubby and kids who have the same interet that i have, makes those family bonding moments much more special and memorable. Back in the days, when we were little ones, you'd see a lot of fights going on between siblings. Today, each one of us have become professionals in the real world and mostly all have their own families. Of course, that would mean more time needed to spend with their own families. But occasionally, we never forget to meet up as one big family. Combine the little families together and you get to see a whole clan of us just sharing the laughter and joys and experiences in life that we go through. It's a wonderful way to see and catch up with whom you used to fight with when you were little. Worst enemies in your childhood days can actually be the happy moments in your present life. Back in the days, when we siblings were still little kids, we used to fight a lot and get picked on if you were the youngest one. Today, all that are just plain happy memories which we would reminisce today when we have our monthly get together moments in Dubai. Despite each sibling having their own families now, they still are a part of the main family where we have originated from and we all just simply share our experiences, joys, and laughter. Who'd ever know that your worst enemy during your childhood days would be your best buds today? True! Staying connected with our families is a big part of our lives. It is also very important for me specially because I just moved to my partner's home away from them. And indeed a trusted and reliable home connection does a big rule. I usually call them through their personal numbers just to check on them and of course to have a little chit chats and the likes, hehe. So thankful of having it as, it is the line that helps me reach them at any time. Hi, it's nice to read (and see from photos) that you've such nice times with your loved ones. I and my parents are apart, each living their own life. However, there's nothing much to do but keep everyone in the heart and wish them luck and health. Every meal together is the precious occasion I never want to be over. Goodluck to you and your family, and cherish all the possible moments when you're together. As a full time mom it is my dailly routine to serve and give my husband and kids needs from foods,clothing and doing the household chores honestly we only have one day of bonding moments and that is SUNDAY were all going to church and I know in that way this will strengthen our family bonds and definitely put us staying together,because I do believe in the saying that the family that prays together stays together...."salat man kami sa maraming bagay ngunit sa kanyang pagmamahal at pananampalataya marami kami at iyon ang nagbubuklod sa amin bilang iisang masayang pamilya"
I came from a broken family. I was 12 when my parents separated and since then, me and my 2 brothers got to live a not so normal life. Sometimes we live all 3 to my mother, sometimes to my father and sometimes, we have to separate to satisfy both. Well, life is hard. But there's also a positive side of that "life". We learned to communicate. We make use of telephones until we had our first cellphones. I always thought that distance will separate us siblings but then, love and communication bonded us together. Nowadays, distance is not an issue anymore. Actually its already a spice in someone's life. With the use of internet, social media and telecommunication, nothing is impossible. I now have my own family and I still practice good communication with my husband. I don't want my daughter to experience what I experienced so me and my husband makes sure that we are always stay connected. Not just on networking sites but connected by the hearts. You see, its the ones that never be broken. Hi Ms. Rochelle! You have such a wonderful and happy family and I Idolized you because despite of your busy scheds, you always find time and never forget your family. Honestly speaking, my parents and I before had a very close bonding. We eat , pray and laugh together. But today, they are so busy and I miss those days. They are always in their job and go home late.. :( Yes, I understand how they wanted us to have a better future, I appreciate that, honestly. But sometimes my sister and I just missed how things before used to be. But despite of their busy scheds, We always find time (my sister and I) to make them feel loved and appreciated by us. We cook food for them and sometimes we treat them in a local resto if we have excess "baon", I soo love my family. Because they are the very first one who I can lean on whenever I have problems in school or whatsoever thing. They know me better than the others. They love us unconditionally. I idolized my mom for being the greatest mom she could ever be, that despite of her age, she continue to work hard for us. My father is also a big inspiration to me. Because even if we are not close as my mom is, he always felt as beloved by him. Sometimes, hes going home with "pasalubong" for us. Every sunday, we go to church and never forget our Almighty God to thank and say sorry for the things we've done. I love them so much. And I just wanted someday after I graduated from college to give back the love and care to them. I wanted them to treat and feel happy everyday. I wanted to give them a better life than we are today.. I wanted them to stop suffering from tired days that they are suffering today..
Wishing you a very happy and prosperous new year. Keep inspiring us. Luv You Ms. Rochelle! Godbless! Being a WAHM.I really needed a good and quality broadband,simply because I am working online,My job at home is my bread and butter so that I can earn . and give everything to my child. I am glad that I have a good internet provider that gives me that kind of service. I think it is basically our family that keeps us grounded and despite all the strains and challenges we face on a daily basis we need to respect that relationship because it is a special relationship that only God has ordained. In life many people come across our path for a reason but the bond we share with our family is what helps us get through each stage of our relationship. For many it can be a challenge to reach out but life can mold us into the people we are called to become only because of the choices we make. I think we nee to move forward and find new ways to reach out and bring positiveness in our lives because that makes us stronger people, strong nurturers, givers, helpers and sustainers. "What do you do to strengthen family bonds and make sure your family stays close together?" And whether we like it or not, technology has also helped us connect with our love ones who are miles away from us. Skype, Facetime or Facebook made us connected with them. I remember the time when I was a child and PC was still not popularized. We used snail mails and we even had to wait for like a week or a month just to receive or send a letter, greeting cards or photos with a letter written on the back for our family member who works abroad. But with the verge of technology, we can now communicate with them everyday, so I can't really say that iPads, smart phones and computers has somehow decreased the strength of family bonding. Though playing scrabble, word factory or sungka are still the best. Also, for me, I believe that RESPECT AND TRUST serve as the key elements into strengthening one's family bond. For without the two, a home will not be called a "home" if family members live in chaos and doubts. Arguments are normal in a family, but when everyone respects one another, no hatred or pain will arise into those misunderstandings. Everything will all be resolved in just a day. If everyone also trusts one another, misunderstandings will not happen. Hence, with respect and trust fully enveloped in one's home, a joyous, loving and strong family relationship will be the result. "One's family is the most important thing in life. I look at it this way: One of these days I'll be over in a hospital somewhere with four walls around me. And the only people who'll be with me will be my family. ang saya =) email sent =) thank u! Im so thankful that it's so easy to get in touch with our loved ones abroad because of the techie generation we have now,.. Setting up a schedule to chat with them is a great way to bond, greeting them on their special day or simply updating each other what's happening and sharing thoughts and plans for the future. As for me, I still find time to call them on their mobile once in a while making them feel more special. <3 <3 <3 With my kids, I always play with them,peek a boo is one of our favorite.Read them stories before bed time,I usually re-read their favorite stories and use their name as one of the character. Visit their favorite fast food chain every sunday after mass.I always tell them how much Daddy miss and love them, since my hubby is an OFW. That their Dad is working for their future, but not to be sad because Daddy's always on skype on his rest day.So, that is a almost 24 hours time to chit chat with him.!!! Tapos pg khit d kmi sama2 kumakain sa lbas aus lng sama2 at sabay2 nmn kmi kumakaen sa bahay bonding n pra samin un lalo at ngdadatingan mga tito tita atbp kmganak instant reunion n amg saya din khit simple lng kung tutuusin...! Its really important talaga na dapat may time ka sa family mo, lalo na sa mga bata. Ako ginagawa ko talaga lahat as a mom and wife to my family, binibigyan ko talaga sila ng atensyon kahit na sobrang busy ako. Yung mga bata, i make sure na natuturuan ko sila sa mga assignments nila everyday. And kahit pagod sa buong araw na pagtatrabaho sa loob ng bahay, palagi ko pa din silang dinadala sa Playground, favorite place kasi nila 'yun. Tuwing hapon namin ginagawa yun. Gusto ko kasi silang makitang masaya at napakasarap sa pakiramdam kapag nakikita mo silang masaya, nakakawala ng pagod yung mga ngiti nila. :) And nagpapasalamat ako kasi dahil din sa internet kung bakit nagkakaroon ako ng communications sa mama ko at mga kapatid ko kahit malayo sila sa akin. Thank you for this post Ms. Rochelle. ;) <3 God Bless po. And Take Care Always. Hi, I think your website migght be having internet browser compatibility problems. Whenever I take a look at your website in Safari, it looks fne however when opening in Internet Explorer, it's got some overlapping issues.